Forests cover about 30% of the Earth’s surface. Over 1 billion people depend on these forests for their survival because it’s their pharmacy, their fuel and food for their animals. Forests keep rivers clean. They prevent soil erosion. They prevent landslides and avalanches. They are carbon sinks because they absorb over one-fifth of carbon emissions caused by fossil fuels. Natural causes like disease and forest fires have always existed. Human activities are now the leading cause of deforestation. No other human activity has caused more deforestation than animal agriculture. We have a better spatial understanding because of satellite and mapping technologies. These 4 global forest maps tell a story or our trees. So let’s take a look and start seeing the forest for the trees. NASA’s Forest Canopy Height map is a first of its kind. It’s unique because it shows the height of trees of the entire planet. Now, NASA didn’t go out in the field and measure every tree height to make this forest map. All tree heights were derived using satellites orbiting our Earth such as Geoscience Laser Altimeter Systems (GLAS). GLAS is a laser ranging technology. It sends a pulse and measures how long it takes to return to get distance. But GLAS wasn’t the only satellite NASA used. It combined Shuttle Radar Topography Mission (SRTM), MODIS, TRMM and the WorldClim databases. Have you noticed how tree heights are generally taller at the equator? Some trees tower higher than 40 meters in height at the equator. At the poles, tree canopy are generally shorter. Countries in northern Europe, Canada and Russia tend to have tree canopy heights less than 20 meters. Almost one-third of our land is covered in forests. But deforestation is cutting down our forests at about the size of Greece per year. That’s 50 soccer fields every minute. The effects of deforestation are devastating. It increases greenhouse gases and soil erosion. It takes away habitat for wildlife and homes for indigenous groups. How can we quantify deforestation? Landsat is the reigning monarch of historic satellite data. 40 years and counting! Landsat is the longest running Earth observation mission in history. We could compare a snapshot of Earth from 1972 using Landsat-1 data, if we really wanted to. The University of Maryland has carved out the drool-worthy Global Forest Change map solely using Landsat data. The key focus is forest extent and change. Forest is defined as vegetation taller than 5 meters. Forest cover loss and gain are highlighted from 2000-2012. We knew there were red flags for countries like Indonesia, Honduras and Philippines and deforestation. On the map, they look like signal flares! On global forest maps like these, it confirms reports and statistics about how these countries sustained great losses in forests.. When there’s smoke, there’s fire. And on Earth, there’s something always burning. NASA’s Moderate Resolution Imaging Spectroradiometer (MODIS) keeps a close eye on wildfires around the globe. Whether they’re started by people, lightning strikes or by other means, NASA’s fire maps pinpoint locations of actively burning fires. Are forest fires harmful for the environment? Forest fires are not necessarily bad. They can clear dead underbrush and restore it to good health. In certain ecosystems, plants require periodic burning to reproduce. 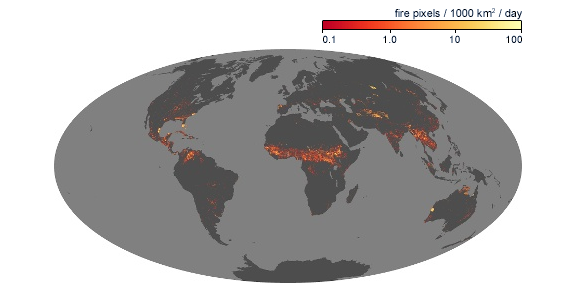 NASA’s fire maps are animated dating back to 2000 all the way to this year. It’s unbelievable watching the time series animation and watching the flames roar our planet. Global Forest Watch is really the mother of all forest monitoring websites. It’s not just one map; it’s a series of forest maps. Each one has cutting-edge algorithms harnessing the power of satellite data and cloud computing. Users can dynamically view Landsat’s forest gain/loss data in near real-time. Global Forest Watch takes it a step further showing how forests are being used such as palm oil, mining, logging, etc. It has time animations, forest fire data and conservation areas. It’s free and simple to use. Governments, businesses, academics, media and NGOs can gain a wealth of information and ensure sustainability. Global Forest Watch really lets you sit in the driver’s seat and openly explore a goldmine of forest maps and information. If an old tree falls in the forest and nobody’s around to hear it, does it make a sound? Near real-time satellite information has transformed our global understanding of forests. Satellites deliver timely and accurate information about forest fires, deforestation, canopy height and even forest disease. Forest maps give users the power to stop harmful forest loss. For example, business managers buying commodities such as palm oil can use near real-time forest maps to see if supplies are clearing forest they committed to protect. This technology empowers people everywhere to better manage forests. … so if an old tree falls in the forest and nobody’s around to hear it, does it make a sound? With these global forest maps, everyone hears it. For GLAS laser, what is the accuracy and reliability of height above ground? Can we expect it to be as good as LIDAR? Global forest map is not only depicting facts of forests, but it alarming environmental crisis to the next generations..
Here’s more one initiative with SAR data.